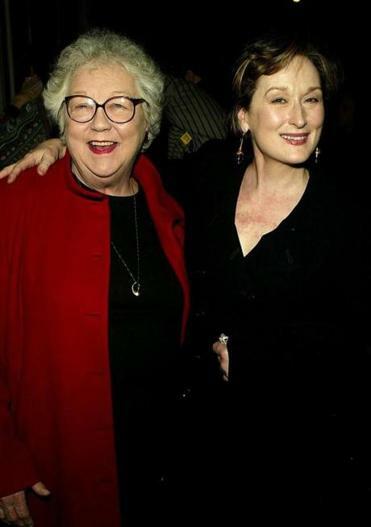 Lois Smith’s clients included Meryl Streep, who flew to her bedside when she had heart surgery. When Lois Smith arrived in New York City in the early 1950s, she thought she would take the journalism world by storm. “She said, ‘Here I am, you lucky people,’ ” said her husband, Eugene. But journalism wasn’t ready for her — women weren’t allowed bylines in those days, and Ms. Smith wasn’t going to settle. Ms. Smith, who retired with her husband to a home they owned on Plum Island in October 2000, died of a brain hemorrhage Sunday afternoon after falling early Saturday morning down a staircase at a converted farmhouse in Bryant Pond, Maine, where she was staying with her husband. She was 84. The Smiths were set to be honored Saturday by Hebron Academy in Maine for a lifetime of service to the school and to the world in general. They received the award in absentia; the flags at Hebron are flying at half-staff this week. Ms. Smith was born Lois Wollenweber in 1928 in Brooklyn, N.Y. She grew up in Malverne, N.Y., and went to the University of Southern California, from which she graduated in 1950 with a bachelor’s degree in English. In 1969, she was one of the founders of the entertainment agency Pickwick Public Relations, which merged in 1980 with Maslansky and Koenigsberg to become PMK, which exists today as PMK*BNC. Dart shared an office with Ms. Smith for 15 years starting in the late ’80s, a time when, Dart said, the public relations field was growing fast. Ms. Smith, she said, was old-school: She had good manners and strong principles that she stuck to. She wouldn’t take a client she didn’t believe in, and she wouldn’t champion a cause she thought was wrong. Dart recalled a cigarette company’s request that the firm participate in an event, and Ms. Smith’s flat-out refusal. Her clients adored her. When she had heart surgery about 10 years ago, her husband said, Streep flew to her bedside, and painted her fingernails. When the bright red rain jacket began to fray, O’Donnell gave her a new one. “she taught me how to live / and how to love... this death thing / is impossible to get used to / i hope my heart can withstand it / sorrow is killing me” wrote O’Donnell. “I feel a tremendous loss,” Redford said in a statement. Ms. Smith won the International Cinematographers Guild’s highest honor for a publicist, the Les Mason Award, in 2003. The award is given for lifetime achievement of a publicist. Even in retirement, Ms. Smith did not settle down. She was a member of the Board of Trustees for the Newbury Library and active with the Friends of the Newbury Library, helping raise money and find books. She worked as a consultant for the Coolidge Corner Theatre in Brookline, her husband said. She worked with Fino to organize the Newburyport Documentary Film Festival, which in 2013 will be in its eighth year, and ran Plum Island Public Relations with Fino for a couple of years beginning in 2008, promoting local events. Ms. Smith and her husband had four children, including one son from her husband’s previous marriage. Their youngest son, Scott, was killed in an accident in 1985. He was a student at Hebron Academy, and the Smiths began a scholarship program in his name after his death. They have been lifetime donors to the school, and helped the school build its covered hockey rink. In addition to her husband, Ms. Smith leaves two sons, Eric of Park City, Utah, and Luke of Newburyport; a daughter, Brooke, of Los Angeles; and four grandchildren. A viewing will be held Wednesday from 4 to 8 p.m. at Elliott, Woodworth and Rogers Funeral Home in Newburyport. The funeral will be Thursday at 2 p.m. at the Old South Church in Newburyport. Evan Allen can be reached at evan.allen@globe.com.